My garden never fails to amaze and amuse me, which I suppose is why I keep it going. Or do I? Gardens are masterful at making us feel like we're in control, when in fact we have very little say over what they choose to give us. It seems that when one crop fails miserably, despite my best efforts, another thrives effortlessly. 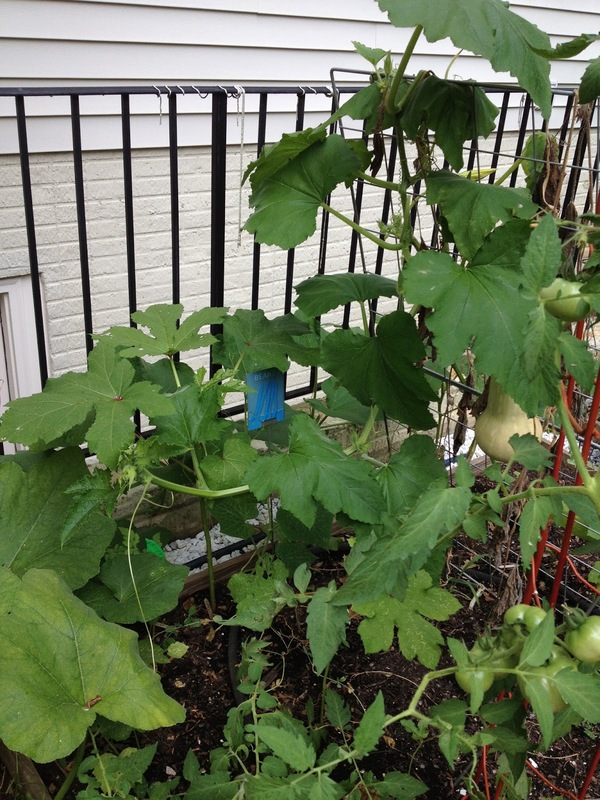 Tomatoes and peppers are inching along, beans are clinging to life, and eggplant left town last week. Squash volunteered to take on a corner, and I let her stay. She liked what she saw, and she now reigns supreme. Volunteers are plants that pop up on their own, where their predecessors dropped seeds in a previous year. I admire their tenacity. Every spring, I coddle seedlings indoors, providing just the right amount of warmth and light. I acclimate them to outdoor conditions over several days and wait for perfect weather before I plant them in the garden. Volunteers spring up outdoors at just the right moment and grow vigorously with no help at all. I'm honored that they find my garden hospitable, and I begin to wonder if seed starting is really necessary. The primary advantage to seed starting is knowing exactly what you're growing. When a volunteer springs up, it's fairly easy to identify the species. Variety is a different story. If previous years' plants are open-pollinated by birds, bees, wind, or other natural mechanisms, off-spring may be different from their parents. My squash demonstrated this perfectly. Decorative solution to a dark corner? 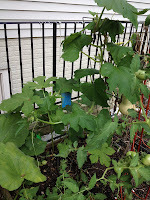 Last year, I planted two squash varieties: Kitchen Garden Seed's Milano Black Zucchini and Seed Savers' Golden Zucchini. 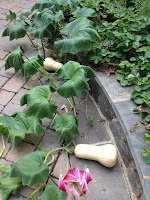 Neither did very well, since my soil was infested with squash vine borers. They are a mess to get rid of, and I typically just harvest what I can and then toss the plant (in a sealed plastic bag, of course). I hadn't planned to plant any squash this year, but when the telltale leaves and spiky stems appeared, I decided to see what would happen. I checked the soil consistently for signs of the borers' eggs, and watched the stems for bulges. The plants seemed healthy, so I let them grow...and grow...and grow. Surprise, surprise! Not only were the vines healthy, but the squash that emerged was neither of the varieties I'd planted previously. Both of the previously planted zucchinis were hybrids, meaning two or more varieties were bred to achieve the desired outcome for Milano Black and Golden. 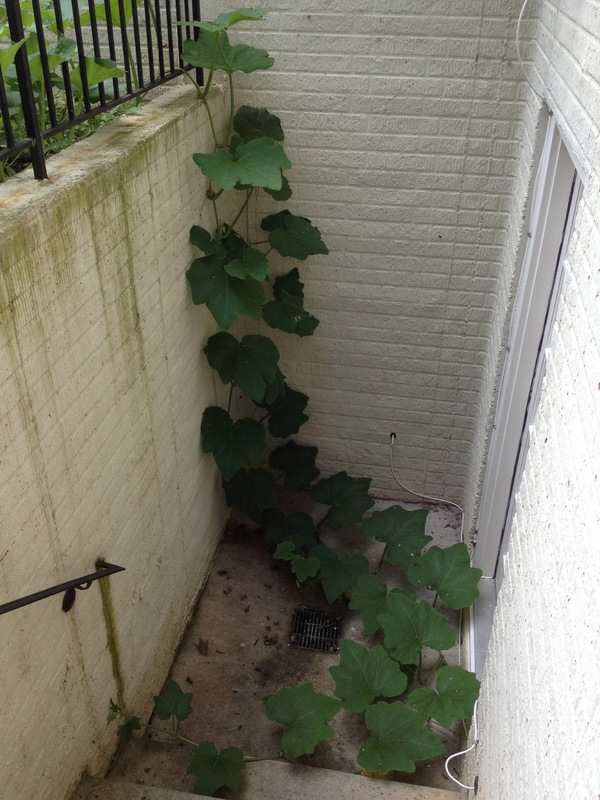 Each of them contained a gene for butternut squash, which is now happily taking over my patio. It is decorative, if a bit aggressive. It will be reined in, but not before we enjoy it baked, grilled, and simmered in soup. 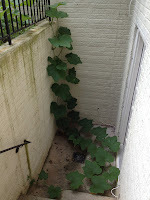 I loved seeing your squash leaves through your lower level windows and enjoy hearing their story of becoming here on your blog. When I saw them, I thought they were lovely and now I know they have a bit of magic to them as well!